In 1890 Herman Brandt purchased a piece of land from the local Nama chief and named it Marie’s Valley after his wife Anna Maria Mahler. In 1912 the settlement became a railway stop for the line between Windhoek and Keetmanshoop. 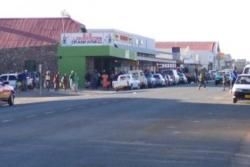 It has since grown with approximately 10,000 inhabitants calling Mariental home. With no true tourism attraction or major sites within its vicinity, Mariental remains a stopover point for visitors moving further down to the south. Little shops line its streets with filling stations and banks offering auxiliary services. The Hardap Dam, Namibia’s largest reservoir, was constructed in 1962 and does provide quaint accommodation and various water activities. When the Fish River floods, causing the dam to burst at its seams, the sluices are opened to relieve pressure. Mariental has been in the way many times with houses and businesses being flooded beyond repair. The dam also supports a few irrigation projects.